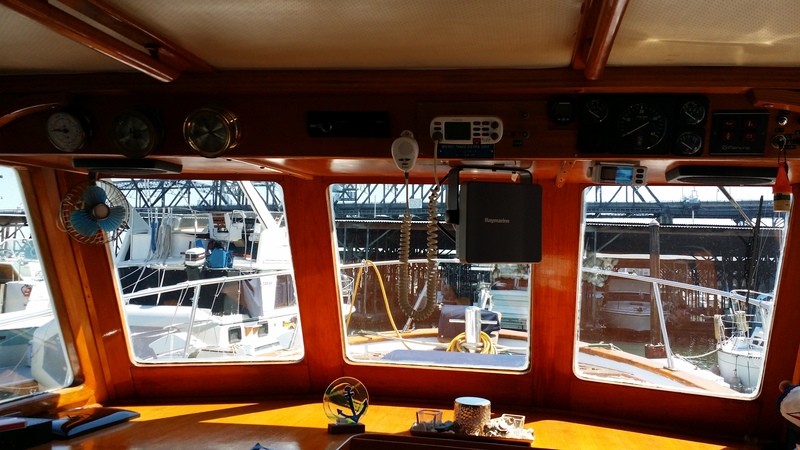 We watch a lot of TV aboard our boat. 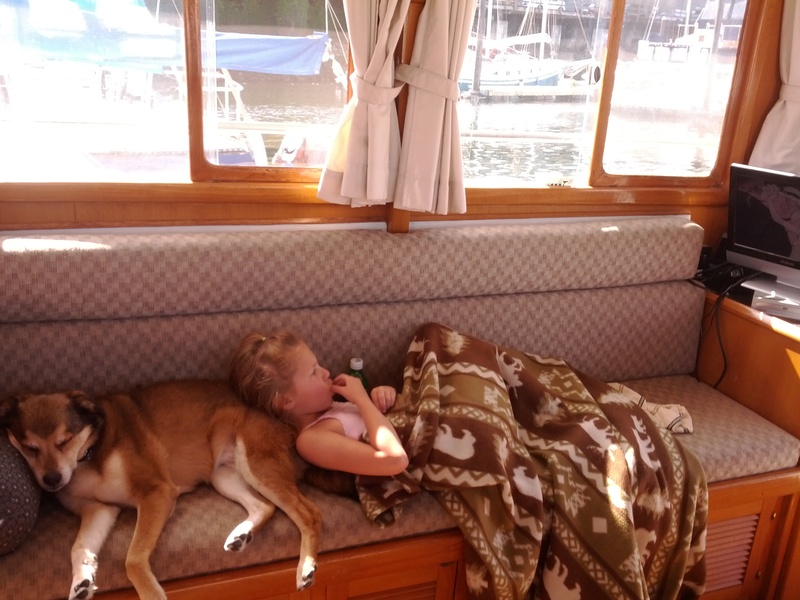 Quite often we will go down to the boat just to watch a Seahawks or Sounders game outside of the house. And most of the time when we are working on a project, we will throw a movie up on the screen. Or take a nap. 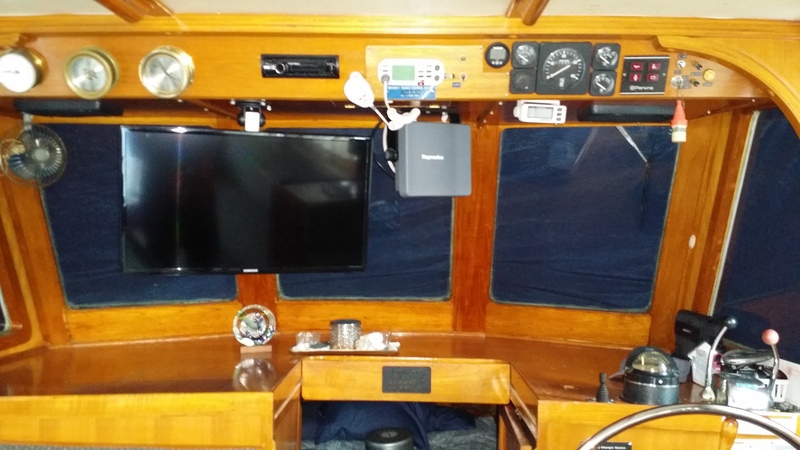 We had a nice LCD TV that we just put in the aft, right next to the sliding door entry. This was not the best spot on the boat for a TV for viewing, as none of the seats in the boat were able to comfortably see it. Plus it had a tendency to fall over in rough water; recently it got knocked off the shelf, and the screen cracked. Taking the opportunity to upgrade, we decided to get a bigger TV, mount it, and move it to a more visible location. Recently we purchased a Samsung TV from Costco, and an under cabinet mount. Then we spent a few hours installing it — a very straightforward process of drilling holes, and running bolts backed with big washers through the ceiling. The mount has a very secure latch on it when it is stored up and out of the way. We haven’t done any electrical work for it yet, but eventually this will be the display for the Chartplotter/Autopilot project too. The Raspberry Pi will be stored up and out of the way in the open area above, with just the HDMI cable coming down and attaching to the tv. I also want to run an inverter powered 110v outlet for the TV to plug into as well. But for now, the power cable can hang down and connect to the current inverter that is located to port, and the TV is perfectly usable.